I don’t know about you, but I felt cold the whole day today! Missionaries are accustomed to wearing white shirts, ties and black pants for two years, so you can understand that I was more than excited to get into some more comfortable clothes for the end of spring. But alas, I didn’t come to any different weather than I left half way around the world. Interestingly, the weather in Cape Town, South Africa is not too different than how we have it now: mid 60s, partly sunny and periods of rain and thunder. The biggest difference might be, however, the fact that they are heading into winter and we in summer. Indeed, the summer solstice begins Wednesday, June 20th but it couldn’t feel farther from reality. Today’s high temperature was at 55°, although that number fluctuated only a degree or two depending where on the peninsula you were today. Bottom line is, it was unseasonably cold, even 10 degrees colder than normal. But I also heard that a week before I came home Bremerton’s high temperatures were flirting with, or even exceeding, the 80s! It seems the weather is acting a lot like my first time trying to drive a manual transmission…a lot of speeding up and then stalling and coming to a screeching halt. The good news is, Mother Nature is getting a handle on the clutch as a large spring storm system has passed and the future looks much brighter in terms on sunbreaks and warmer temperatures. Tomorrow won’t be exactly the biggest breather day for everyone, however. 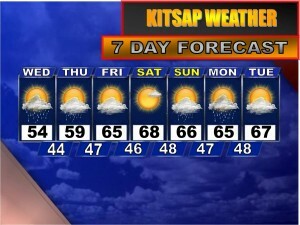 The weather models show the southern half of Kitsap (say Bremerton southward) completely dry while northern Kitsap will still have straggling showers to battle through. Either way, for everyone it looks mostly cloudy and still unseasonably cool with highs in the upper 50s. Thursday, Friday and Saturday is one progressive trend of sunnier, warmer and more seasonable weather. If you’re planning any outdoor activities, Friday and Saturday will be the best days to do it. 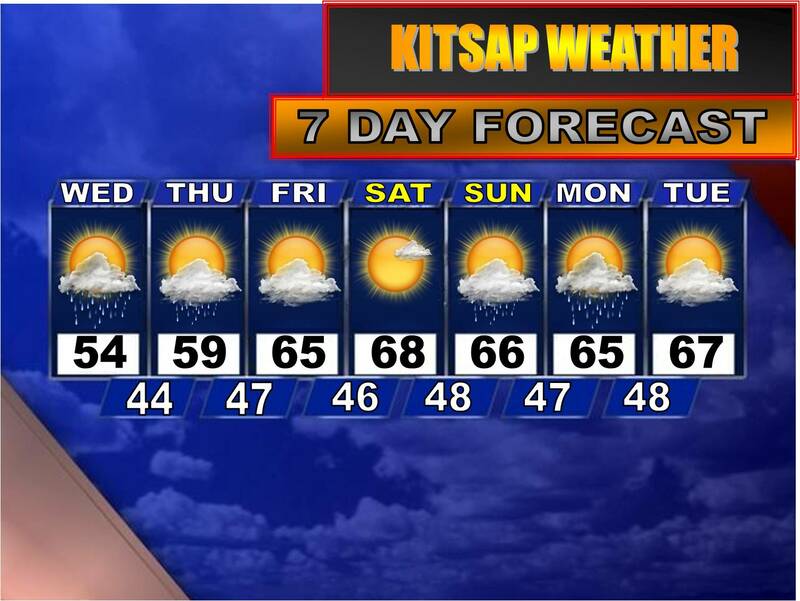 Both days highs will be near 70 with partly to mostly sunny skies. Sunday a weak weather system slips by and looks to drop a few rain showers before leaving us high and dry again for the first few days of the new week next week. Highs still look normal, being in the mid 60s.